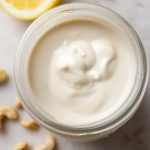 I love simplicity and am always looking for ways to share them here, and this vegan cashew based ‘sour cream’ is another wonderful addition to the recipe collection! With only 5 ingredients and so easy to make, you’re going to love this tangy, creamy condiment. 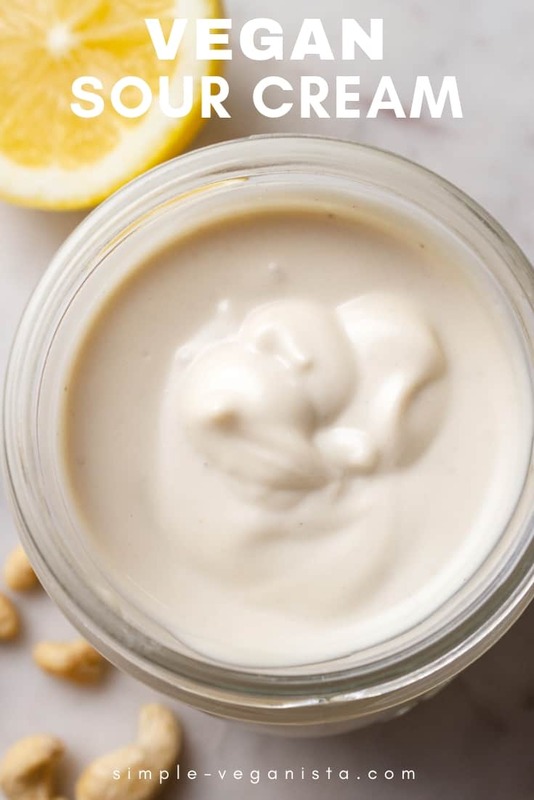 This vegan sour cream recipe is made with raw cashews, lemon juice, apple cider vinegar, salt, water, and blended until creamy smooth. Takes 10 minutes to make and will last up to 5 or 6 days in the refrigerator. 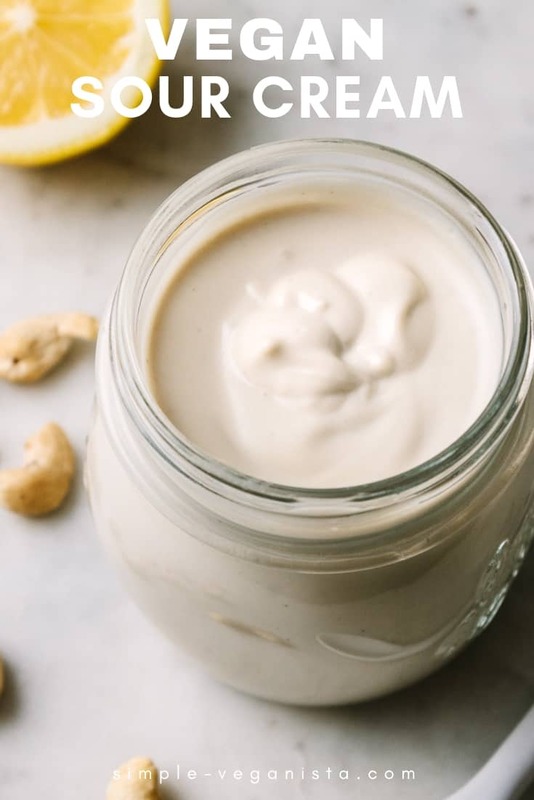 Cashew sour cream is rich and tangy, and tastes absolutely amazing! This vegan condiment is raw, soy-free, non-dairy, and cleaner than any sour cream you will purchase in the grocery store, vegan or not. I think you’re going to love it and find it will enhance a variety of meals and recipes. You will be amazed how these simple ingredients come together to make a vegan sour cream of your dreams! It is recommended to soak your nuts before processing. I know we snack on nuts without soaking or eat them in our foods without going through this process but it does have some advantages. The soaking of the cashews will increase enzyme activity, offer greater absorption of the food’s nutrients by the body and help to increase digestibility. But please don’t panic if you don’t have time to go through this process, you’ll be just fine if you don’t. Soak cashews covered with 2 – 3 inches of water for 2 – 3 hours, overnight is great too but not necessary for cashews. For a faster soak, add them to hot water and let soak for 5 minutes. Find more about soaking here: How to Soak & Sprout Nuts, Seeds, Grains & Beans from Vegetarian Times & The Benefits of Soaking Nuts and Seeds from Food Matters. 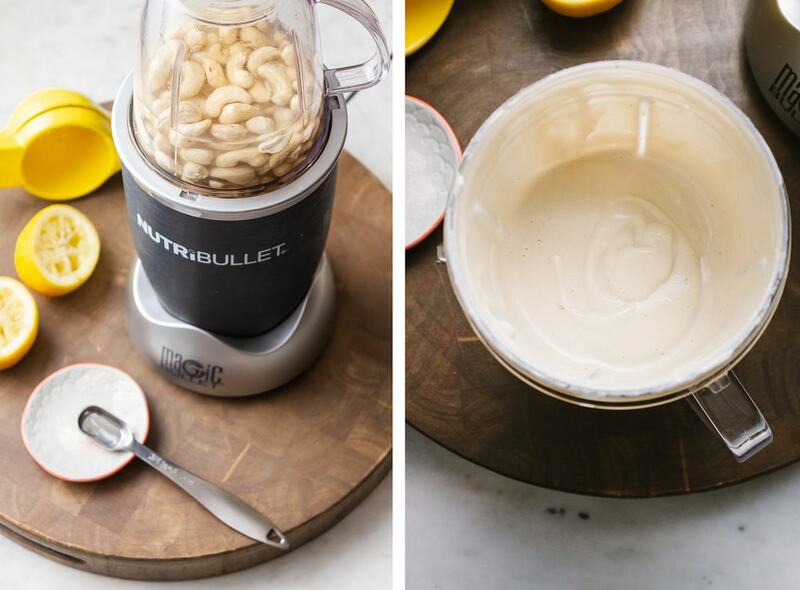 The process for making vegan cashew sour cream is super simple. 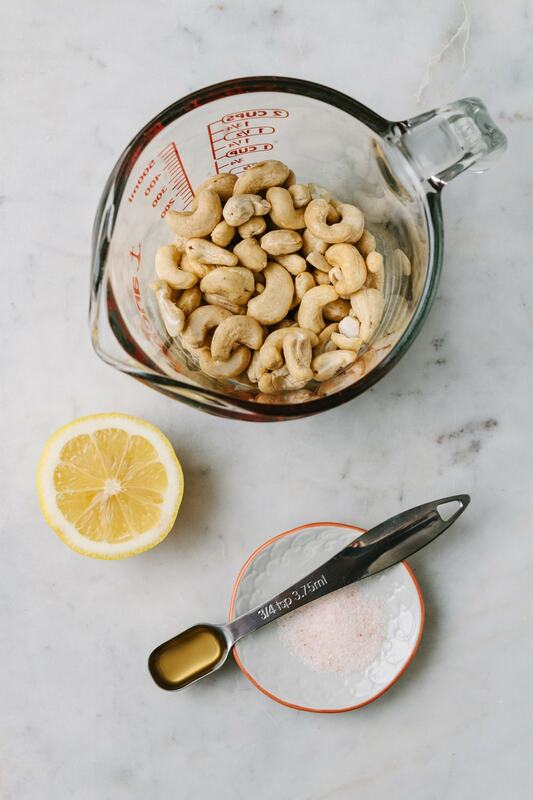 Once cashews have been soaked, place them in a high-speed or personal blender along with water, lemon juice/apple cider vinegar and pinch of salt, process until creamy smooth. If using a large blender, stop every so often to scrap down the sides. I love and recommend the Nutri Bullet (<< affiliate link) for small jobs like this. It’s compact and works fantastic! And that’s it, thick and creamy vegan sour cream in minutes! So now to the good stuff, and where you can use your homemade vegan sour cream. Use anywhere you would normally use sour cream. Try adding a dollop on Cuban Black Bean Soup, Texas Three Bean Chili, Raw Taco Salad, Street Tacos, burritos and baked potatoes for starters. Use in baking whenever sour cream is called for like this Sour Cream Banana Bundt Cake from VeganYumYum. When making ranch or onion dip let this be your go to sour cream. Try using it in stroganoff recipes or blend in your Vegan Mashed Potatoes. Make a sour cream fruit topping by adding maple syrup and dash of vanilla for a sweet, tangy dessert. 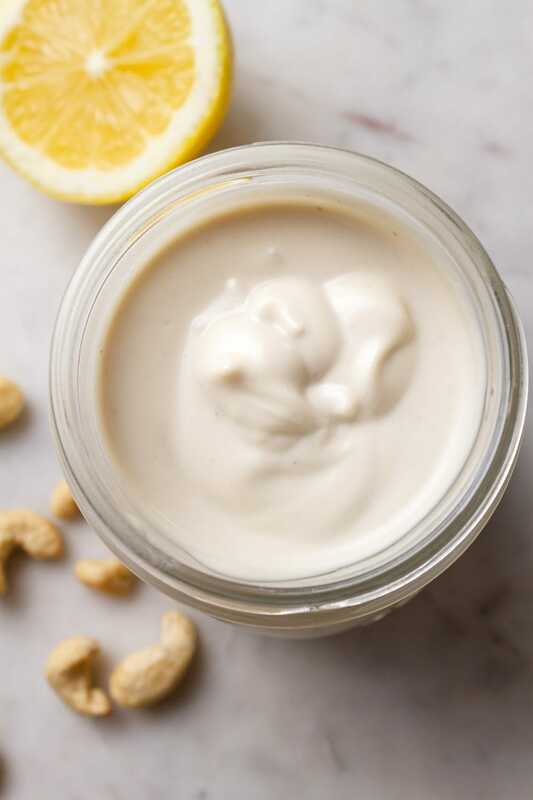 From sweet to savory, this cashew sour cream will come in handy and save the day! This vegan cashew ‘sour cream’ can be used anywhere traditional sour cream is used. Place a dollop on chili, baked potatoes, ect. You can also use it in baking when called for. Soak the cashew in 1 of 2 ways, then drain and rinse well. In food processor/high-speed blender, add all ingredients and blend until nice and creamy, stopping to scrap down the sides every now and then. Add a tad more water as needed to create desired consistency. Sour cream is best refrigerated for at least an hour before serving, but will do fine if served right away. Sour cream will thicken upon being chilled. Makes about 1 1/4 cup. Will keep in refrigerator for 5 – 6 days. Use lime instead of lemon and add a few sprigs of cilantro at the end for a Lime Cilantro Sour Cream. Try adding a few dill fronds and 1 tablespoon dijon mustard for a Dill Sour Cream. Make a sour cream fruit topping by adding 2 tablespoons pure maple syrup and a dash of vanilla to this recipe. Top on strawberries, blueberries, grapes, mango, raspberries, oranges, etc. Adding extra water will depend on how long you’ve soaked your nuts. The longer you soak, the more water they’ll absorb making for less extra liquids needed. Less water will result in a thicker sour cream while more water makes it thinner. If you feel you’ve put in too much liquids, add a few more cashews and blend until smooth. Keep in mind that refrigerating will also thicken your cream. Equipment: I love and recommend the Nutri Bullet (<< affiliate link) for small jobs like this. It’s compact and works fantastic!